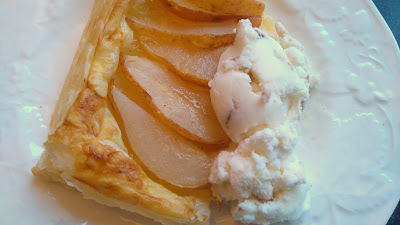 I am sharing two wonderful Autumn Fruit Puff Pastry Desserts. One thing I get asked a lot, usually when I am experimenting with recipes and I post them on Facebook, is “Can I have that recipe? ” Well yes, of course, you can. I am happy to share my recipes especially when something works out so well and is so tasty. I had these question numerous times recently when I produced two Autumn fruit Puff Pastry Desserts in the last couple of weeks – what is a girl to do when puff pastry was on special offer and Autumn fruits are plentiful? This Pear and Ginger Slice was my first dessert I attempted – now I know you can make Puff pastry from scratch but even Mary Berry from Great British Bake off says if you can buy it do and Aldi have reduced it down to 89c, so fill up your freezers. Score a margin 1/2 inch inside the pastry rectangle and layer the sliced pears neatly inside this margin. 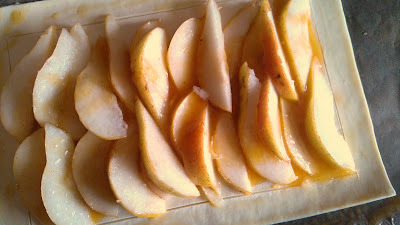 Pour the Honey/Ginger mixture over the pear slices. Brush egg wash around the pastry 1/2 inch edge with a pastry brush. Place in the oven for 15 – 20 minutes or until golden brown. I served this with Vanilla Ice-Cream and it was gorgeous, so much so, there were requests for seconds! The next week I decided to try Apple and I am a huge fan of Maple slices, so I got out the Maple Syrup and tried it – again it was so good that plates were cleared and leftovers buy flagyl tablets were asked for – not that there were any! You can also head to my Start Here page and find more, tasty recipe. Or Sign up to Snapshot and Snippets Newsletter and receive exclusive recipes each week and a FREE copy of my Snapshot and Snippets Recipe EBook.